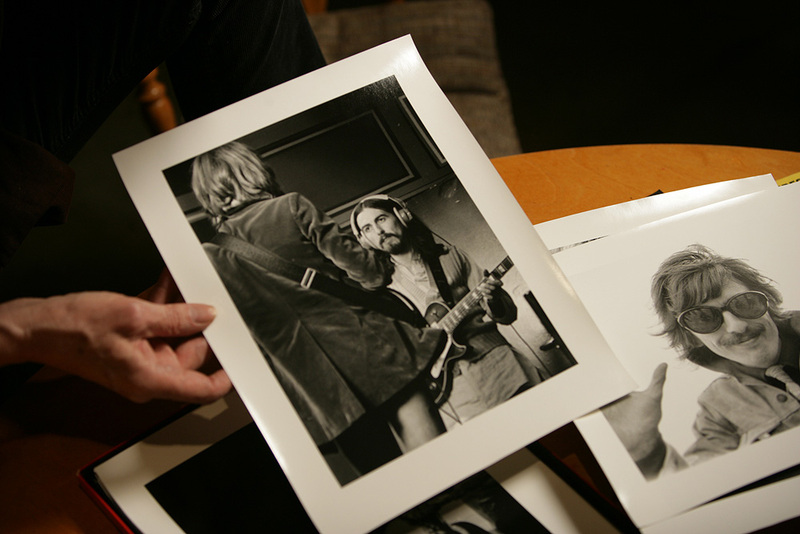 Photographer Barrie Wentzell holds his photograph of George Harrison in a still from the documentary Melody Makers. (November 30, 2016 – Toronto, ON) It’s coming on 50 years since a good friend of mine, Ed Pickersgill, and I created a little underground tabloid in Montreal to promote local bands. It was late 1966 and Canadian airwaves, already saturated with American music, was beginning to be overrun by the British Invasion. We daringly named our little publication POT, which we convinced people stood for Promoters of Talent. In a very direct way the roots of Northernstars.ca can be found in that early effort to draw attention to Canadian Talent. Meanwhile, across the pond, a tabloid that had started in the jazz era was shifting focus to embrace the rising tide of rock music. 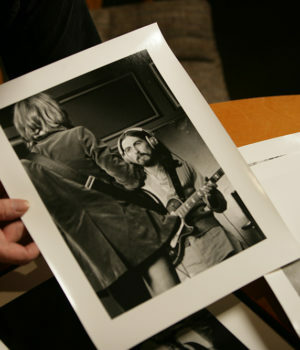 It was called Melody Maker and one of the early documentary photographers that supplied the images was Barrie Wentzell. Skip ahead 30 years. It’s 1996 and Wentzell is now living in Toronto and has the original negatives of every picture he has ever taken. He’s ensconced in Toronto’s first live/workspace for artists when one day in walks actor, director and film festival founder Leslie Ann Coles. She needs someone to shoot stills for her debut short, In The Refrigerator. And that’s where a long 20-year journey to a film that screens this weekend at the Whistler Film Festival begins. 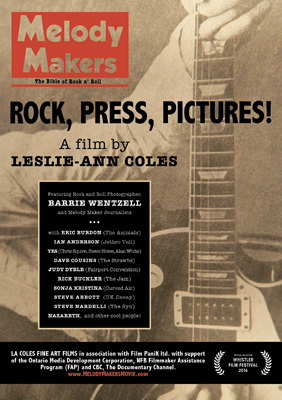 I had a chance to exchange emails with Leslie Ann who agreed to answer some questions about her debut feature-length documentary about the photographer and the era of the Melody Makers. NS: How long after meeting Barrie did you think about doing a documentary? LAC: I had seen his rock ‘n’ roll photos and he would often regale me and others with stories from behind the pictures. It took a few years but I turned the camera on him in 2006. NS: It’s taken a long, long time to get this film made. When did you start? And, did you ever think of giving up? LAC: Right, well the early pre-interviews with Barrie inspired a series concept that would feature different photographers who captured various musical genres. Barrie being the rock episode. I researched the various photographers, pre interviewed them and wrote a seres which won a CTV Banff Fellowship. Unfortunately this limited arts entertainment series coincided with the plethora of realty-based series being pitched at Banff in 2008. Although there was significant interest, the decision makers were hot on the trail of reality. 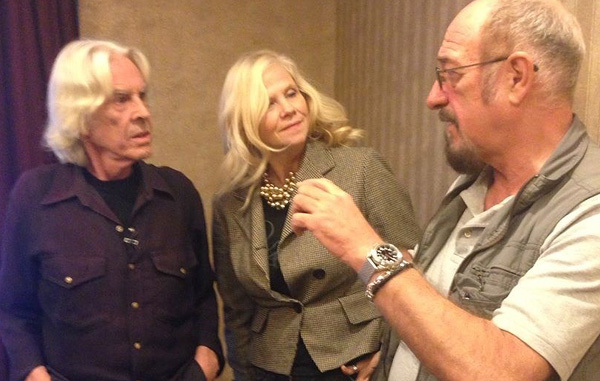 I was determined at that stage to turn toward producing a feature documentary involving Barrie. I was already invested in this project and generally speaking, I never give up on anything once I put my mind to it. NS: What was the major stumbling block in getting it finished? LAC: The major stumbling block was lack of financing. First, it was the lack of production financing and then it was due to the lack of post-production financing. NS: How many times did you pitch this idea before you found backing? LAC: Originally, I pitched it as a series. Then, it became this intimate artist portrait about a rock ‘n’ roll photographer who emigrated to Canada from the UK. But when I realized it was a much bigger story about this rock publication, Melody Maker magazine, which was founded as a jazz musician’s trade paper in 1926. I pulled the project back and applied for development funding which I received and traveled to the UK to interview Barrie’s colleagues, musicians and other subjects who were familiar with the magazine. This seminal magazine launched the careers of a multitude of legendary rock musicians, many of whom continue to rock to today, some 40 years later! I kept going back to the CBC, and sent a 95-minute rough cut to Commissioner, Bruce Cowley who offered me a pre-license which helped me finish the film. NS: Is it just us boomers or do you think that era of rock has broad appeal across all demographics? 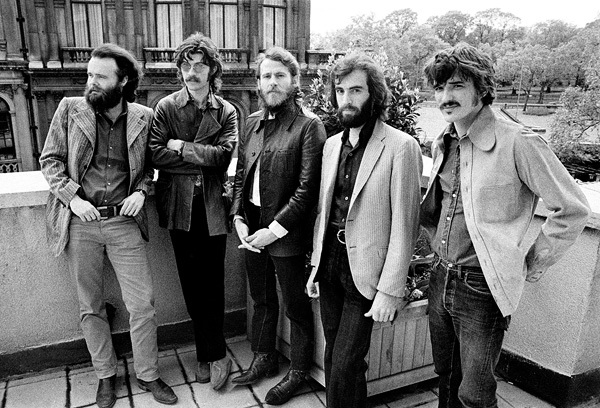 LAC: I have discovered there’s a classic rock ‘n’ roll renaissance and young people are clambering to hear YES, Pink Floyd, Zappa etc… I do believe this film will appeal to wide demographic. There’s something for everyone. NS: Is Barrie still working as a photographer? LAC: He shoots when he wants too. When he feels like it. He has a gorgeous floral series (pics from his garden), and he shoots local musicians, and will always take a few snaps of beautiful women. NS: What was his reaction when you screened the finished film for him? LAC: Barrie has only recently seen the documentary in its completed form via vimeo. I look forward to having him see the documentary on the BIG screen in Toronto, in the new year. He’s really ever only concerned with the quality of the photos. I believe he appreciates the story and how it was constructed. NS: Other than your remarkable perseverance, what lesson did you learn from this project that you can pass on to other filmmakers? LAC: I learned so much about the post-production process and about negotiating rights. The most important lesson I learned was that you should get agreements signed as soon as you have reached a verbal agreement. And, it’s always wise to have an Executive Producer who is an Entertainment lawyer, or one who understands entertainment law. NS: What are you working on now? LAC: My primary focus is getting Melody Makers to festivals and to the international marketplace. I would still love to do the series and this may look more like a digital series now. I also have a few shorts and features kicking around that I aim to resurrect. I really want to shoot a drama now! I have also returned to acting and recently signed with a fabulous agent, Jessica Martins, Hero Artists. Although my clip reel was a bit dated she says I have great range, so she signed me. I love performing, I really do. So, I’m looking forward to working on the other side of the camera too. Melody Makers screens at the 16th annual Whistler Film Festival on Saturday, December 3 and Sunday, December 4. Click here for more about Leslie Ann Coles. This article is Copyright © 2017 by Northernstars.ca and may not be reproduced without written permission. For more information about copyright, click here. Ralph Lucas is the Founder and Publisher of Northernstars.ca. He began writing about film while in radio in Montreal in the mid-1970s.